Mining for valuable jewels is a regular theme of online slot machines and here it’s the turn of Diamond Jack to dig for riches alongside his partner Sofia; this game is developed by Betsson and it comes with plenty of free spins and a clever ‘Walking Wilds’ feature. Diamond Jack is a five reel slot with three rows and ten fixed paylines; it’s a bright day behind those reels where carts of colourful jewels occasionally appear from the mine on the left hand side. Higher value symbols in this game include a bag of jewels, Sofia, Jack, an elk and an eagle; coloured gems in the shape of playing card symbols make up the lower values. There’s no standard wild in the base game but the sticks of dynamite represent the scatter symbol. This is triggered by landing Jack on reel one and Sofia on reel five on the same spin; you’ll now be prompted to pick one and that character will expand to fill all positions on that reel and become wild. Over subsequent spins they will move one place to the left or right (depending on your choice) with each matching symbol landing behind them freezing in place and acting as a wild symbol also. The feature ends when they reach the other side of the reels. This is triggered by landing three, four or five of the dynamite scatter symbols anywhere in view for which you will receive 5, 10 or 20 free spins respectively; any Jack or Sofia symbols which land will become sticky wilds but it’s not the Walking Wilds from here. More spins can be triggered by landing three more scatters during this round. 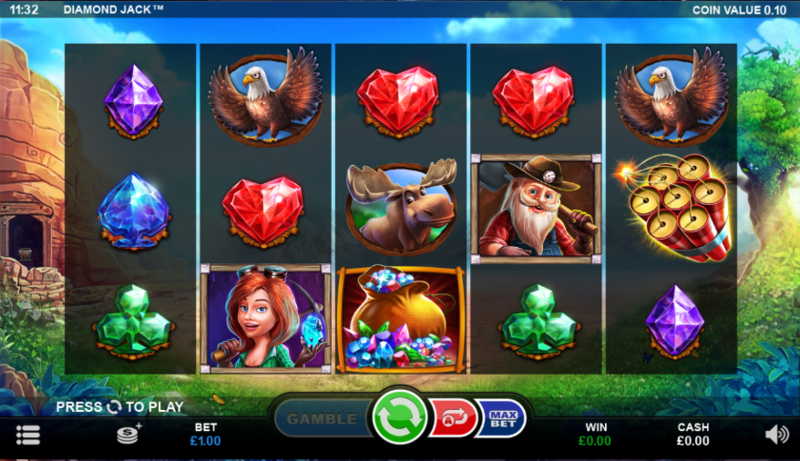 Diamond Jack is a very enjoyable and colourful addition to the ranks of mining-themed slots and we particularly like the Walking Wilds feature; it’s also possible to gamble any wins with the ‘Gamble’ button below the reels but that depends on your tolerance to risk.